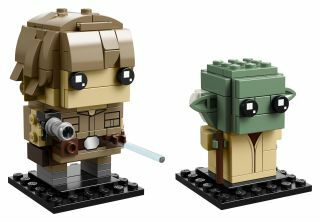 Luke Skywalker and Yoda as Lego BrickHeadz. The 215-piece set will be available Aug. 1, 2018. Lego's BrickHeadz line will roll out some of the most iconic "Star Wars" characters ever this summer, and we've got a sneak peek for you here. "The Empire Strikes Back" is a pivotal film for Luke Skywalker. It's there that he heads to Dagobah to train with the diminutive (and green) Jedi master Yoda and learn the ways of the Force. The Lego BrickHeadz version will feature Luke (still with both hands) and his first lightsaber, while Yoda sports green, pointy ears and a cane. The set comes with 215 pieces and will be available for $14.99. That's a bit higher than the normal $9.99 price for a Lego BrickHeadz set, but this kit does come with two characters and more pieces than a normal set. Princess Leia Organa as a Lego BrickHeadz. This set comes with 124 pieces and will be available Aug. 1, 2018. While Luke trained with Yoda, Princess Leia was busy fighting the Empire with the Rebel Alliance. In BrickHeadz form, Leia's classic bun hairstyle comes out in full Force (sorry, I couldn't resist). She wears a white robe and carries a blaster. The set comes with 124 pieces and will be available for the more typical $9.99. Boba Fett as a Lego BrickHeadz. This set comes with 161 pieces and will be available Aug. 1, 2018. We don't see a lot of Boba Fett in "The Empire Strikes Back," but his Lego BrickHeadz form does the character justice with some awesome custom printing to depict the bounty hunter's iconic green helmet. Like his film counterpart, BrickHeadz Boba has a helmet-mounted sight (Lego calls it an antenna), a jetpack and a blaster, with a printed utility belt. Boba's helmet sight doesn't appear to move like the ones on the helmets worn by Sabine Wren and other Mandalorians in "Star Wars Rebels," but it still looks cool. BrickHeadz Boba will come with 161 pieces and be available for $9.99. This isn't the first time Boba Fett has appeared in Lego BrickHeadz form. Last year, Lego released a set with Boba Fett and Han Solo in carbonite as a 2017 New York Comic Con exclusive. So, there you have it! A preview of Lego's latest "Star Wars" BrickHeadz characters to build with your little Jedi (or, in my case, a little Sith) at home. What do you think? Are these the Lego BrickHeadz you were looking for, or should they have stayed in a galaxy far, far away? Let us know in the comments below, and may the Force be with you. Always.